Thank you for visiting ZAtlanta.org, the official home of Z Atlanta! While still in our initiation phase, Z Atlanta is proud to say that we have grown to over 1,500+ members. 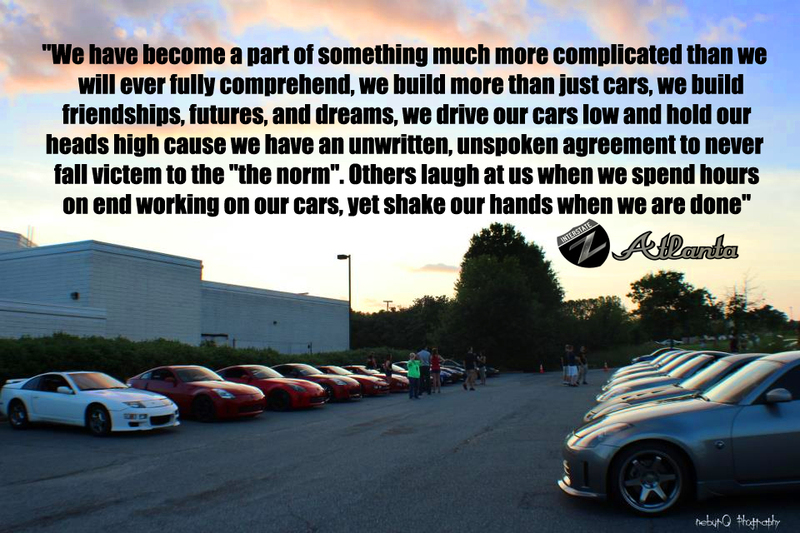 Our group is dedicated to providing other Nissan and Z enthusiasts with useful information and a place to call home. Please make sure to visit our events page to find the next meet near you! Z Atlanta Has partnered with Darkdog Customs! Check them out on our sponsor page for all your interior restyling needs! Z Atlanta and Creek Hollow Customs have partnered to offer our members a top of the line service for all of your hydro-imaging needs. Z Atlanta t-shirts are available in the store! Z Atlanta stickers are here! Check the store for options! We are continuing to design the website each day so please be patient with us during this exciting time. The website is up and running!